Not In This Lifetime indeed. Much like most of the known universe, I got hooked on GNR by seeing the Paradise City video in constant rotation on MTV when I was 8 years old. Being a bit too young to see them in their heyday, plus all of the ensuing drama, I didn’t think I’d ever see any “real” incarnation of GNR. So when they announced the tour, they hit Toronto and I wasn’t going to be able to make that work – but then the 2nd leg was released with a Buffalo date on it, well, it was a no brainer. 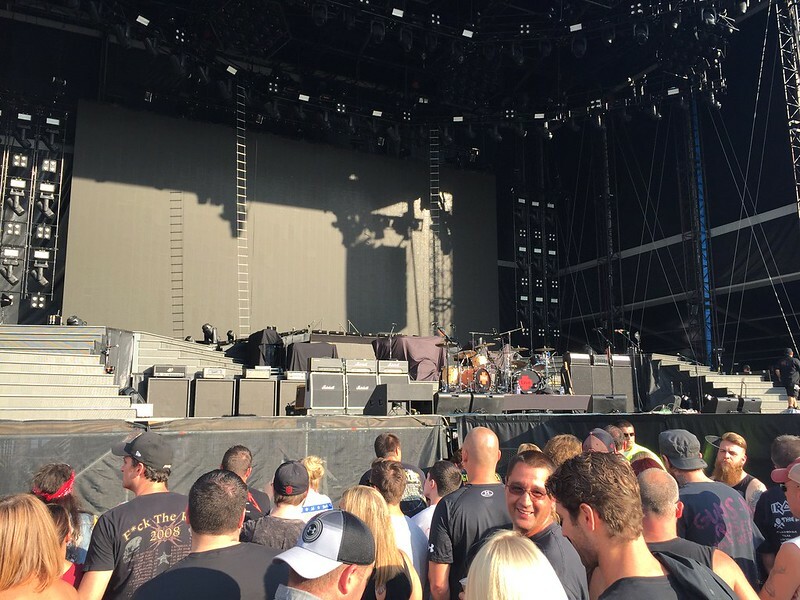 I went wild and spent big bucks to get a GA Pit ticket down front – when am I going to see GNR again? As the show got closer, Sara hit me up to join her and her co-workers in taking a limo bus! So this show, and now tailgating super-close to the gates, and I don’t have to drive? Count me in. So we get on the bus, get to the stadium, and hang out for quite awhile. We all split and meandered in – I wandered down front as I was fairly interested to see Live. I’d never seen them, save for seeing Ed Kowalczyk at KRockathon a couple years ago, and besides an Audioslave cover (I Am The Highway) in tribute to Chris Cornell, it was an all-killer no filler radio hits setlist. One super curious note – two full drum kits and two drummers! Apparently usual drummer Chad Gracey had suffered an arm injury and wasn’t 100%, so they recruited Robin Diaz (who’s played with a bunch of people, including Theory of a Deadman, Daughtry, Candlebox, Smashing Pumpkins, etc.). They sounded great and obviously a lot of people were enthusiastic about seeing them. Our Lady Peace had been opening a couple of the other dates on this tour and probably would have had an even better reaction, but no matter. Now it was time for GNR. The pit filled in pretty solidly by this time, I camped out on the left hand side, and the band came out to the opening strains of It’s So Easy. The setlist was pretty varied, and even with Duff and Slash back in the band, there were three Chinese Democracy songs in the set also. I frankly wasn’t going to care too much what they played, but they did play a bunch of the deeper cuts I like (Mr Brownstone, Double Talkin Jive, Used To Love Her, My Michelle). They too did a tribute to Chris Cornell, playing Black Hole Sun in addition to a couple other covers. The band sounded fantastic, Axl didn’t hit every single note, but was perfectly fine. I don’t have a super thorough review for this one, other than to say that the whole night and the whole set was a ton of fun, and having the core three dudes playing these songs (I know, I know, where’s Izzy?) in such a huge stadium show environment was a blast!